The growth of mobile devices, smartphones, and social networking services have forever changed the way we take photos. Today, we continuously snap pictures, pausing only to selectively share the best to our network of friends, family and followers on sites like Facebook and Instagram. 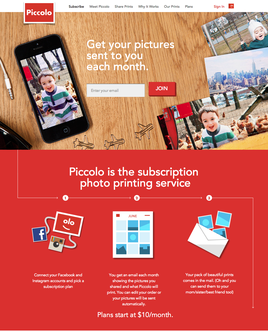 Today, a new photo-sharing startup called Piccolo is launching into beta with a service that aims to make photo printing easier, by offering a tool that works alongside our current behavior rather than trying to change it. The startup was co-founded by developer and consultant Nicholas Hall with Kate Oppenheim, a partner and executive producer at m ss ng p eces, a Brooklyn-based creative production company which has worked on a range of projects from American Express commercials to Google’s “How It Feels Through Glass” video. Oppenheim explains that she had the idea for the startup after struggling to sort through the thousands of photos she had been saving to Dropbox via an IFTTT recipe which automatically copied her Facebook and Instagram archives over to the service for safe-keeping. “It was very frustrating,” she says of trying to find the photos she wanted to print. “Also, I was going through this very strange process of having to download photos and uploading them again which was really slow – a lot of the photo-printing sites out there are built on old technology,” Oppenheim explains. Those sites are also poorly designed and overloaded with upsells, she adds. Eventually, she just gave up. But that frustration, as is often the case, led to inspiration – that of a “set it and forget it” subscription offering which picks the best prints for you. Although there are tons of photo-printing services out there today, as well pre-paid plans for avid photo takers, what makes Piccolo interesting is how it determines what to print. When users first connect their social accounts to the service, the app analyzes how many photos you regularly share, then makes a suggestion of which subscription plan would best fit your needs – the mini, mezzo or max plan, offering up to 20, 40 or 60 prints per month, respectively. The mini plan is $12 per month (or $10 if you sign up for a year), then it’s $15 for the mezzo (or $18/mo. month-to-month) and $20 for the max (or $24/mo. month-to-month). “We hope that you pick a plan that meet your needs every month, so you don’t have to do a lot of work,” Oppenheim says. “But if you go over your plan – if you pick the mini plan but you have 26 photos, we’ll print the 20 most popular photos,” she explains. 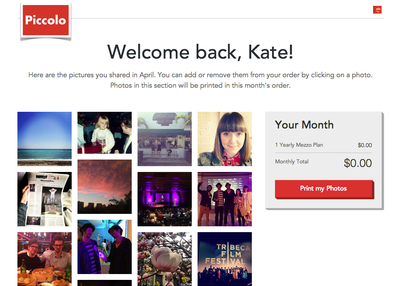 In addition, on the first of each month, Piccolo sends out an email reminding you of the photos you’re about to have printed, which you have two days to respond to by going online and editing the selection if need be. The photos are then printed using a professional lab, offering quality that’s beyond that which the drugstore kiosks provide today, Oppenheim notes. Given its pricing, the service is not at all the most affordable option – the big-name brand photo-sharing sites easily have it beat – but the idea is that users are paying for the convenience, not just the prints. This idea, to some extent, has been attempted before. The Y Combinator-backed photo printing service PicPlum that debuted back in 2010 (before losing a co-founder to Twitter earlier this year, after the other had already picked up a day job of his own) does something similar. But PicPlum’s product was never fully developed – users had to email in their prints, and there wasn’t the same sense of automation to the overall process as there is with Piccolo. Piccolo is a bootstrapped startup, with only the two co-founders as full-time employees for now. In time, the plan is to roll out support for more supported services as well, including Flickr, Picasa, Tumblr and others. TechCrunch readers interested in testing this out for themselves can sign-up here for an invite. The company will prioritize those sign-ups, and let in the first 100 people during this closed beta period. You can also use the code “TECHCRUNCH” at checkout for a free first month.